Welcome to Back In Time Warehouse, we are the restoration specialist! We offer a large selection of just about any retro game room item you can think of. 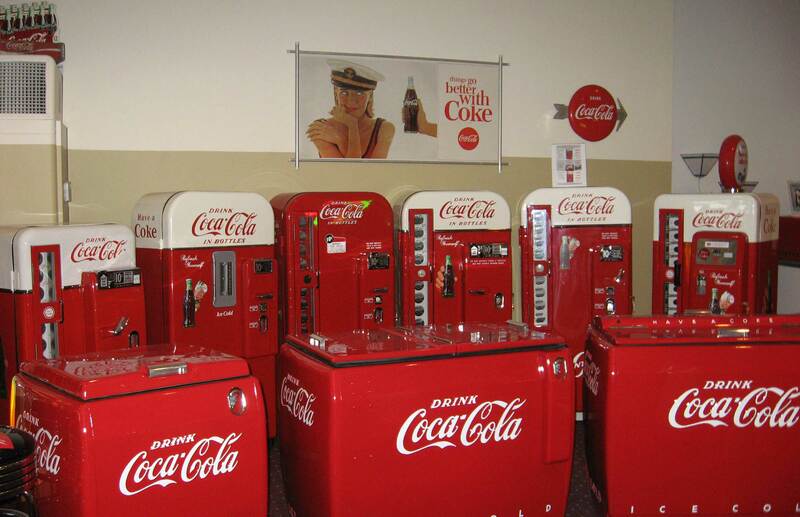 We restore Coke machines, vintage soda machines, candy machines, juke boxes, gas pumps, and other items to better than new condition. These vintage soda machines can be done in a wide variety of soda brands including Coca Cola, 7up, Dr Pepper, RC Cola, and several other soda brands. All of our restored soda machines come with a two year warranty. Visit our Restorations page to see first hand what goes into our restorations. We moved into our current restoration facility back in 1997 when we purchased the building. It is locate at 415 W. Liberty St, Charles Town WV. The facility houses our Decal and parts business https://sodadecals.com/ as well as our restoration facilities where we restore Vendo 56 Coke machines, Vendo 81 Coke machines, Vendo 110 Coke machines, Cavalier 72 Coke machines, Cavalier 96 Coca Cola machines, Cavalier Coca Cola chest coolers, Westinghouse Coca Cola WD-10 chest coolers, Westinghouse WD-12 Coca Cola chest coolers, VMC Pepsi Cola 81’s, VMC Dr. Pepper 81’s, VMC 7-UP 81’s and other soda machines.